Riot's grim gargoyle takes a statuesque new form. Galio has always been a bit of an odd duck in the League of Legends roster. The hulking gargoyle is—or rather, was—an anti-mage with a slow, skillshot based kit, an absurdly (but quietly) powerful shield that healed as damage ticked away, and an ult that was either game-winningly strong or interrupted by a slight breeze. Riot has just unveiled the new, updated Galio, and the gargoyle has evolved into a mighty colossus. Galio’s been subject to some pretty big changes in both kit and personality, but some of the things that made the character a neat niche pick have remained the same. Galio’s next auto attack does an area smash, dealing bonus magic damage. This is the first indicator that Galio is moving away from his classic poke role: while he still has Magic Resist scaling, Colossal Smash also scales with AD. If you hit a new champion with any ability, Colossal Smash’s cooldown is reduced. In short, Galio is rewarded for being in the thick of a fight, and has a little bit of that AOE clear that was on his old kit with a well timed E > Q combo, but he can’t hang back anymore to get the full effect. Here’s the real show stopper. Galio gets a magic damage shield. It’s less fancy than his old W (and there are no mini Galios circling him, which was always oddly charming), but it gets the job done against AP heavy teams. Fine, right? It gets better. His old ultimate, the AOE taunt, is now a basic ability. Holding W puts Galio into a defensive state, where he crawls and channels around him. There’s no stunning him out of W, so your best bet is to run away before he releases it. When W is released, Galio executes his trademark AOE taunt, and this time you can control the length and range by holding W longer. No more Flashing in for a five-man taunt, but no more getting stunned by pretty much anyone on the Rift either. This opens up a pretty obvious seeming weakness—just run away from Galio and you’re good, right? Well, boy howdy, we have the rest of the kit to explore. This is reminiscent of Vi’s Vault Breaker, but it's not as versatile. Galio can’t escape over walls with it, and he can’t dive through a team. Wind up, dive at a guy, punch him into the air. Sure, it ain’t flashy, but it's one of the abilities that makes a kit work. Besides, he has his old ult on his W, he can stand a simple gap closer and CC one-two punch. Once Galio lands, he does magic damage to everyone in the area and knocks them up. If you’re in the center of his landing zone, you’re knocked up for longer. And then you have to contend with a mad Galio likely dropping a W on you. If you were looking for a fresh spin on the old, classic Galio, you might be a little disappointed. The Galio from the before times was a quiet, remorseful sentinel who stood for Demacia. A guardian is always prepared, he’d rumble. Now he doesn’t quietly muse so much as he shouts, loudly, about how great it is to punch people. There are hints of something a little less frat boy-ish and enthusiastic underneath the bravado, but the old Galio is gone. 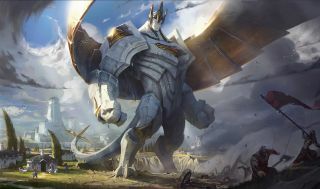 Galio has gone from a failed sentinel to a symbol of Demacia, a great stone guardian who rises in Demacia’s hour of need and freezes when he’s no longer required. It’s a drastic departure from the original vision of the character, and an interesting one. Galio, as he was, was a mirror of the world. He was a character based on the wizard who made him, the nation he failed, and the girl who inspired him to take up a new mission. Now, he’s a statue given life, enamored with his brief glimpses of this big, strange world. Interestingly enough, he best mirrors Sion. They’re both warriors given life to participate in this never-ending war between Noxus and Demacia. One longs for rest, the other yearns to be alive for just a little longer. It’s a neat parallel. The most recent step in completely overhauling League’s old roster, Galio is an interesting experiment. He’s a departure from the old Galio in theme and kit, and Riot have been ruthless in isolating what worked about him and shearing away the rest. My only worry is that they may have been too ambitious in changing his personality; it’s a complete 180 from solemn guardian to Buff Daddy Warrior. As a one time Galio main, I’ll miss watching him flap around the Rift surrounded by little versions of himself and shooting lasers out of his eyes. However, his new kit may bandage the wound in time.